Elementary music classes are held throughout the entire school year. With your contribution the classes are offered at less than $10 a week. Program contributions cover only part of the cost of the teachers, music, and transportation. Saratoga Music Boosters subsidizes our elementary program because we feel it is extremely important to introduce children to music. Each member is essential to the success of the programs. Your support and membership help to ensure that every interested child is able to participate. Please note that our programs are limited to Saratoga USD students. You can download the Elementary Beginning Instrumental Music program registration form, complete it and send your form and check contribution to your music teacher. ​Should you wish to contribute with your credit card, click here. All music classes are held throughout the entire school year. Your contributions to Saratoga Music Boosters (SMB) allow us to fund teachers, music, uniforms and transportation as necessary. Each member is essential to the success of our programs. Your support and membership help to ensure that every interested child is able to participate. Please note that our programs are limited to Saratoga USD students. 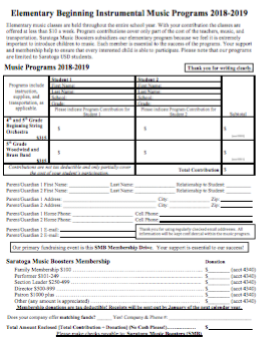 You can download the Redwood/Saratoga Music program registration form, complete it and send your form and payment to your music teacher. ​Should you wish to pay with your credit card, click here. We are thrilled to have four orchestra classes in the school day at Redwood! While SUSD covers the yearly expense of our in-school orchestra teacher and some quantities of limited classroom materials, it takes more to have a successful music program. We ask for your help in supporting our orchestra program and allowing us to provide our program with additional instrument accessories, new sheet music, new instruments and equipment, festival registration costs, transportation as necessary, coaches, specialty clinicians, and more. Your support and membership help to ensure that we can support every child with a top-notch music education! You can download the Redwood Adagio, Presto, Vivace & Chamber Strings registration form, complete it and send your form and check contriubtion to your music teacher. Should you wish to contribute with your credit card, click here.